All communications from the University of Illinois at Chicago, whether originating from a college or a specific program, are reflections of the institution. 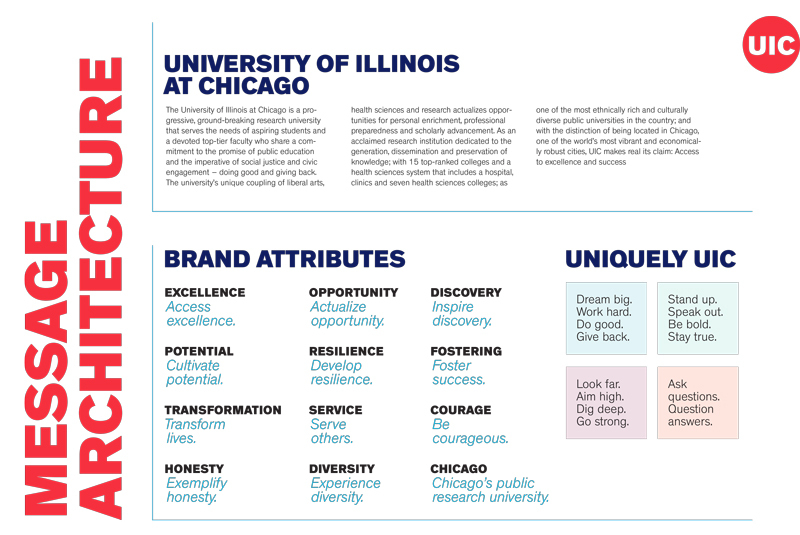 The logos, typefaces, colors, and treatment of photos and text all project attributes of UIC. The goal of these guidelines is to improve the effectiveness of the university’s communications in today’s crowded environment, while reducing overall design expenditures for individual pieces. Maintaining consistency in messaging and design across the university strengthens the institution’s brand overall. Inherent in the notion of identity is identification. The university is not in itself a brand or a personality. Rather it is an expression of values and ideals that reflect the institution’s raison d’être, and that, in turn, reflect the values and ideals of those who choose to identify themselves with it and who therefore embody, enrich and extend all that the university stands and strives for – students, faculty, scholars, researchers, clinicians, health scientists, providers, patients, administrators, alumni, donors, Chicagoans. The online Style Guide is an abbreviated version of the full UIC Style Guide. Click here for the full UIC Style Guide. 1330 University Hall 601 S. Morgan St.